There are few moments where I can say my life was forever changed after watching a concert film. And at the top of the list is watching D.A. 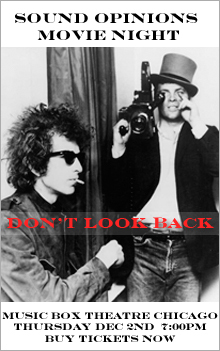 Pennebaker’s 1967 rock doc Don’t Look Back which captures Bob Dylan during his 1965 UK tour. And now Sound Opinions is giving you the chance to see it on the big screen. Part of the final exam for the class involved writing a research paper, and I choose to write mine about the cultural impact of Don’t Look Back and how D.A. Pennebaker’s cinéma vérité shooting style influenced the way concert films were made ever since. This movie news is also connected to a previous concert fan story and experiment involving Bob Dylan’s 1965 tour, which is why I’m stoked to tell you that you can see Don’t Look Back on the big screen in all its revolutionary glory when Sound Opinions co-hosts Jim DeRogatis and Greg Kot screen it at the Music Box Theatre on Thursday Dec 2nd. If you don’t own a copy yet and you’re a concert film fan like me, here’s a link to pick up Don’t Look Back and check out other D. A. Pennebaker legendary concert films via Amazon. The Music Box Theatre, 3733 N. Southport Ave in Chicago. Doors open at 6 p.m. show starts promptly at 7 p.m.
Tickets are $9 in advance here. WBEZ members enter discount code “Subterranean” at checkout. Any remaining tickets will be $10 at the door. Cash only.